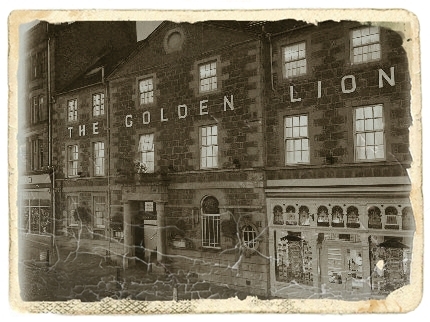 Robert Wingate's Inn - now the Golden Lion - opened it'sdoors in 1786, and soon gained a reputation as the place of choice for visitors to the Royal Burgh. Among these early patrons was Scotland's national poet, Robert Burns, who inscribed his famous 'Lines On Stirling on his bedroom window after the first of two short visits in 1787 - the second visit being in order to smash the window in question (for more on that visit the 'Out & About' section of this website)! During a recent visit to the hotel, ghost-hunters reported encounters with a pair of sad phantoms on the second floor, lamenting the loss of the Wet-Bar on that level, removed during renovations in recent years.